In the philosophy of Bhakti Yoga, the Absolute Truth is known as a person. His name is Krishna, a Sanskrit word which means “all attractive”. Krishna is a beautiful youth with a glowing complexion the color of rain clouds. He plays a flute, attracting the hearts of all, and His smile is enchanting. He wears a peacock feather in His curly black hair and a flower garland around His neck. 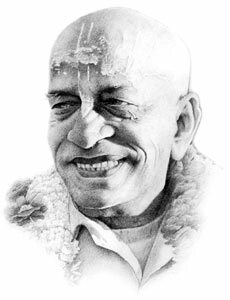 Through the practice of Bhakti Yoga we can develop our personal relationship with Krishna.